My parents would be celebrating their 44th Anniversary today. 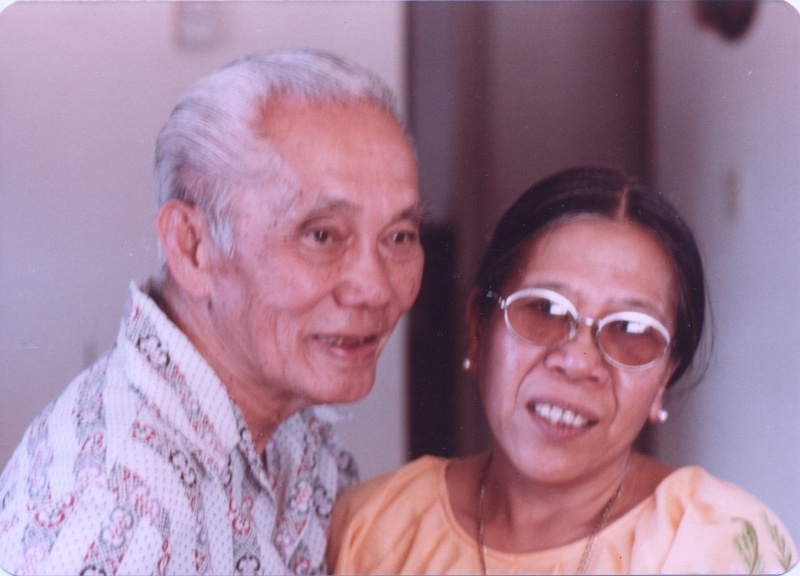 They met in 1965 or 1966 after my mom came to California from the Philippines. My mom was a nanny and my dad was a bartender. Somehow their paths crossed, I'm assuming that my mom's cousin fixed them up, and in 1967, they got married in a small desert town in Southern California. A year after they were married, I was born and would be their only kid, though I know they wanted more. I would have loved to have another sibling, but it wasn't in the cards. There was a big age difference between them. My mom was 38 when she got married. My dad was almost 63. They had 25 years together before my dad died. My dad came to America in 1924. The goal was to assimilate and over the years, he had forgotten how to speak his native language. So when my mom and dad got married, she had to re-teach him the language. Tagalog is the national language of the Philippines, but both of my parents were from the Ilicos region so their local dialect was Ilicano. After I was born, they only spoke in English. Still in the late 60s and 70s, assimilation was key, so there was no desire to teach me their language. For the longest time, I was happy to only know English. But as I grew into adulthood, I longed to understand it, even if I couldn't speak it. The bay area has a large Filipino population and I'm embarrassed whenever someone speaks to me in Tagalog and I have to say "I'm sorry, I can't understand." My parents worked hard to create a modest life in the high desert. By American standards, we were below the poverty level, but compared to my parents relatives 'back home' we were wealthy. We had a 3 bedroom home, 2 cars and healthy meals every day.To say my mom was frugal is an understatement. Looking back at how much income they brought in, I don't know how they managed to save as much as they did. They did their best to raise me American, and I became exactly what they regretfully wanted...a spoiled American kid who resented her frugality and her old customs. Though i still studied hard and got good grades, never smoked or did drugs and almost always obeyed her rules. My dad was a very quiet man, leaving most of the discipline to my mother. I can only remember once when my dad raised his voice at me. He was already retired by the time I was in school, so he was the parent I spent the most time with since my mom was working. He was the most influential presence in my life. However, now that they're both gone, my mother has left the biggest impact. Thinking back on our strained relationship, I can't help but wonder about what could have been done to strengthen our relationship. Hindsight is 20/20, but now there's so much time to think about what could have been. Photo from early to mid 80s in our house. Don't know the occasion or who took the photo. A marvellous tribute to your parents, Mad. Hard working people with a dream of success. It's very hard to leave your homeland and settle in a new country, where you don't know the customs or the life, I know, because I have done it. You are right about the life parallels.... my parents met when they were both older too, my dad was 24 years older than my mum, and I was born when he was 62, and I am an only child too. And another similarity... my dad grew strawberries so he was at home most of the time, and mum worked during the summers in the local fish'n'chip shop.... they definitely were not rich, but they managed to live a happy healthy life in a beautiful village by the ocean. Happy 44th Anniversary to your parents, I am so glad that you posted this! oops almost forgot to wish you and Jimmy a Happy 4th of July! Enjoy the fireworks. What a sweet tribute to the parents who raised you as an American, Mad. I'm sure it wasn't the easiest thing in the world for them to do. But I'm very sure they would be proud of you today!